Are you all veggied out, or are you thirsty for more? Pickups are from 5-8pm at Sunnyside Community Services this Thursday. Get more details about what’s in the box this week with Golden Earthworm’s weekly newsletter. Items below are subject to change. Also look out for our Winter Sign-ups coming soon! Sweet Potatoes – Freshly dug and more to come! Remember that sweet potatoes need to stay above 50 degrees or they will get cold damage. Store in a cool spot. Use within 3 days. 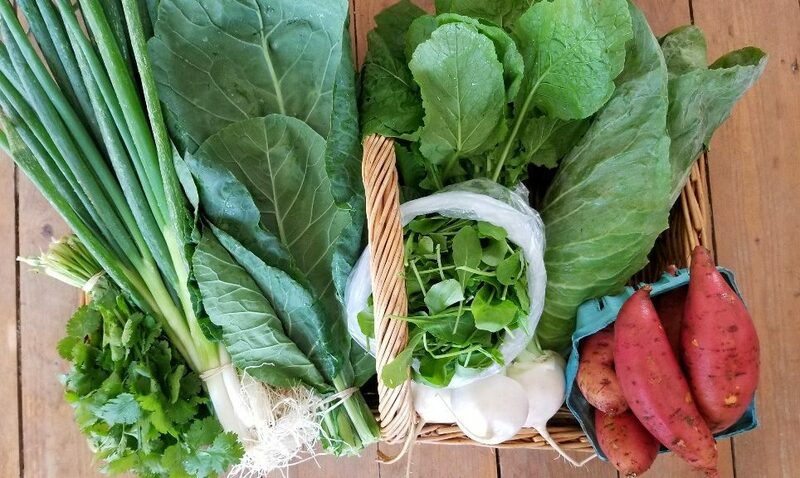 Collards – Collards are very similar to kale and can be used interchangeably in recipes as long as you give it a little more time to cook. Store airtight in the fridge. Use in 3 days. Sugarloaf Chicory – Wonderful paired with sharp cheese, olive oil, lemon juice and garlic in a salad. Store airtight in the fridge. Use in 5 days. Japanese Salad Turnips – These are wonderful when roasted together with the radishes. Store airtight in the fridge. Use in 5 days. Red Radishes – Try roasting these! They’re delicious (and beautiful) when roasted in the oven. 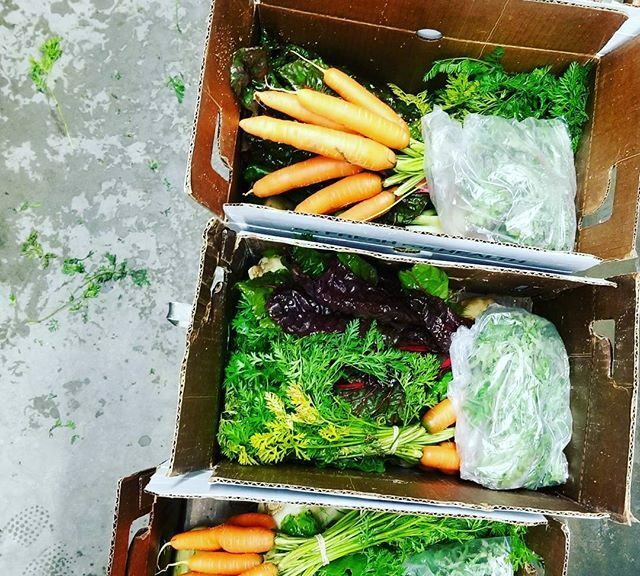 Store airtight in the fridge, separate roots and greens. Use in 3 days. Parsley – Adds bright flavor to dishes. Also freezes very well. Store airtight in the fridge. Use in 5 days. Red Potatoes – These are a waxy, red-fleshed variety. Excellent for roasted potatoes. Store in a cool, dark place. Use in 10 days. It’s that time again–this week Lewis Waite will be there for pickup as well. Pickups are at Sunnyside Community Services from 5-8pm. 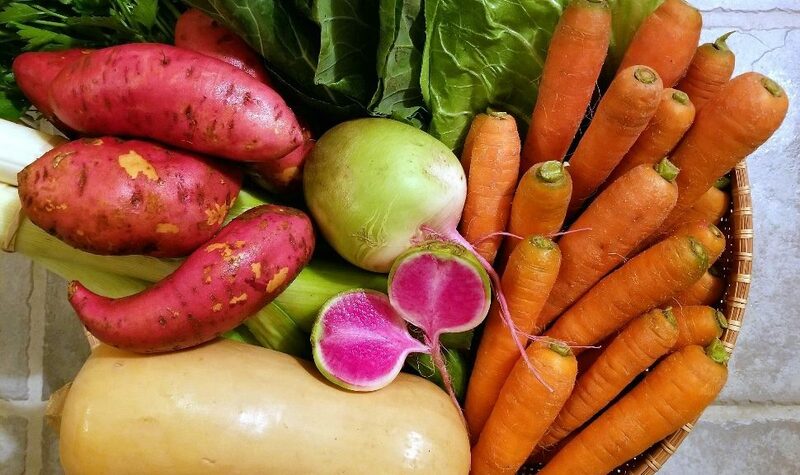 To see complete info for vegetables in the box this week, check out Golden Earthworm’s weekly newsletter. Sungold Cherry Tomatoes – Also known as tomato candy they’re so sweet! Ready to eat when fully yellow! Storage on the counter, use now. 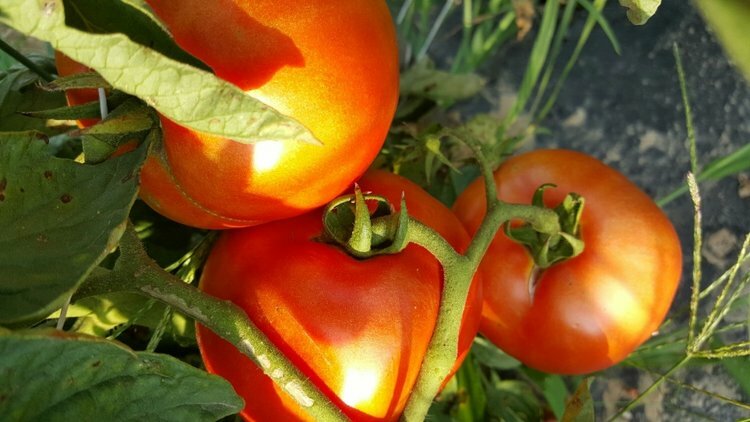 Red Tomatoes – The secret to a good tomato is letting it ripen (and not refrigerate). Storage on the counter, use when they are a deep red all over. Kohlrabi – Crunchy and delicious in summer slaws and salads. Remember to peel and remove the skin. Storage in airtight storage in the refrigerator, use in 5 days. Yellow Watermelon – First red, now yellow! These are fragile, so please handle them carefully. Store in the fridge, use within 5 days. Red Potatoes – There’s nothing better than freshly harvested potatoes–these are great in salads. Store in a cool (not cold), dark place, use within 2 weeks. Mustard Mix – Remember these beautiful spicy greens from earlier in the season? They’re back! Store in airtight storage in the refrigerator, use in 3 days. Hello wonderful CSAers–we’ve got another delicious week of food for you coming up. Plus Backyard Bees soap shares will be there this week (there was a mixup with delivery last week). Baby Watermelon – Heads up that these babies are fragile! A cracked watermelon is usually still fine, as long as you get it into the fridge right away. Store in the fridge, use within 3 days. Red Tomatoes – Let the tomatoes sit out on the counter until they reach a deep red color–then eat and enjoy! DO NOT REFRIGERATE. Parsley – Make a parsley salsa verde with this bunch. Store in an airtight container in the fridge. Use within 5 days. Cucumber – We are just about finished up with this cucumber planting! Store in an airtight container in the fridge. Use within 5 days. 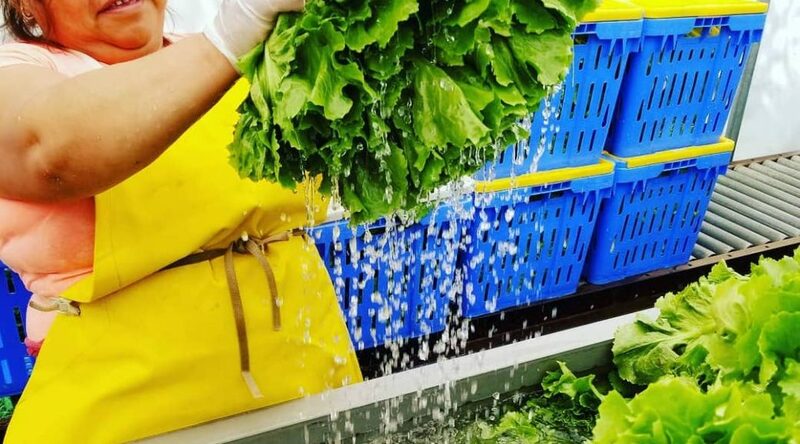 Green Batavian Lettuce – Batavian lettuce loves the summer heat! Store in an airtight container in the fridge. Use within 5 days. Sweet Corn – This planting has only yielded enough for a few ears per member. Spread the wealth by cutting them into a salad for all to enjoy! Store in an airtight container in the fridge. Use within 3 days. Red Potatoes – Their water content is high so it takes less time for them to cook. Great in a potato salad. Store in a cool (not cold), dark place. Use within 2 weeks. 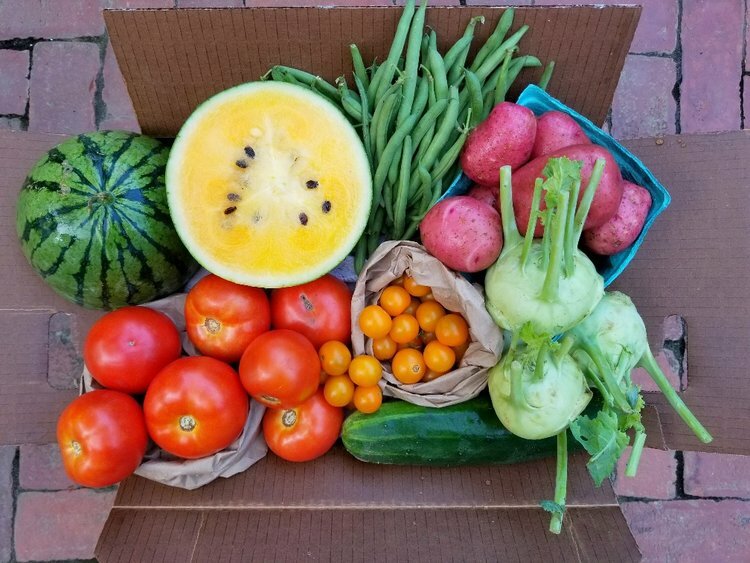 This week EVERYTHING is here for pick-up–including fruit! Don’t forget to check all your lists, and enjoy your food. 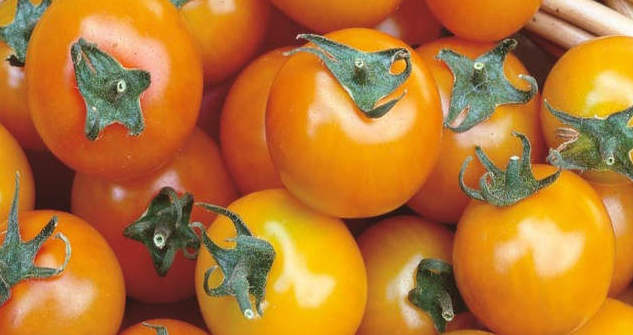 Sungold Cherry Tomatoes – These are the sweetest, most flavorful cherry tomatoes we can find. They are currently in rotation with baby watermelons–whichever you don’t get this week will come next week. Store on the counter. Use within 3 days. Green Beans – We’re moving into the second green bean planting now, so these are fresh, crisp and sweet. Store airtight, in the fridge. Use within 5 days. Fennel – Summer fennel is here! Not a fennel lover yet? Try the caramelized fennel with goat cheese recipe before you give up completely. It’s a hit! Store airtight, in the fridge. Use within 5 days. Cucumbers – Cucumber overload? Here’s 58 more ways to use them. Store airtight, in the fridge. Use within 5 days. Red Batavian Lettuce – Batavian lettuce is loving this summer heat, and we’re loving our salads. Store airtight, in the fridge. Use within 5 days. Red Long Onions – These are delicious sliced and grilled and then served in salads or on sandwiches. Store airtight, in the fridge. Use within 5 days. Still going strong with the salads, but there’s quite a bit of other veggies in the mix this time. All vegetables this week should be stored in an airtight container in the fridge. Baby Arugula – Super baby size, best eaten raw. Use within 3 days. Escarole – This lettuce-looking green is best eaten two ways: cook the outer leaves, eat the inner ones raw. Use within 5 days. Collards – These are great as wraps–you can blanch ahead of time and store in the fridge so they’re ready to go. Use within 5 days. Red Beets – Another two-for-one…the greens can be cooked and eaten like spinach, the roots are sweet and tender this time of year for cooking or eating raw. Use within 5 days. Cilantro – Get ready for pesto time! Use within 5 days. Japanese Salad Turnips – These roots don’t need to be peeled, and can be eaten raw or cooked. The tops can also be wilted and eaten like spinach. Use within 5 days. Bok Choi OR Spinach – Whichever one you didn’t receive before, you should be getting this week! Use within 5 days. Last pick-up & last days to register! This is the last week for Summer Shares! But not to worry, you can still sign up for Winter Shares until THIS FRIDAY–options for fresh winter crops and preserved summer goodies. Today is also the last day to reserve a table at the annual CSA Holiday Market, held Dec. 14. And don’t forget the 50/50 raffle is still going. Proceeds benefit our Subsidized Share Program. We’re currently around $500, which means you’d get half of that if you win!! And, here’s what’s in our last box for November 16th. Pickup at Sunnyside Community Services from 5-8pm. Fruit shares this week are bosc pears + jonagold and granny smith apples. Sweet Potatoes– 2.5 lbs of various sizes! Store in a cool, dry spot–not the fridge. Use within 10 days. Carrots – A big bag to preview some of the sweet winter veggies. Store in the fridge. Use within 10 days. Rutabaga – Another round of these slightly sweet, tasty root vegetables. Store in the fridge Use within 5 days. Butternut Squash – Try it mashed–it may be your new holiday favorite. Store on the counter Use within 10 days. Collards – A yummy holiday traditional dish in the South. Store in the fridge. Use within a week. Leeks – It’s the last round for this great vegetable. Store in the fridge. Use within 10 days. Watermelon Radish – If you haven’t tried this variety before–you’re in for a treat! These are great raw or cooked. Store in the fridge. Use within 10 days. Red Kale – A great, versatile variety. Store in the fridge. Use within 5 days. Register online to reserve a table at the annual CSA Holiday Market, held Dec. 14. One week left–registration ends Nov 15! And, here’s what’s in the box tomorrow, November 9th, at Sunnyside Community Services from 5-8pm. Fruit shares this week are fuji and jonagold apples. Veggies are below (all vegetables this week except the potatoes are best stored in an airtight container in the fridge). DON’T FORGET, this week is a special products pick-up too! This includes fish, beer, kombucha, soap and Lewis Waite orders. Fennel – It’s back again! If you need recipe ideas, a comment feed just started on the Golden Earthworm Facebook page. Use within 5 days. Carrots – Sweet, crunchy carrots of the Mokum variety. Use within a week. Rutabaga – A winter favorite. These are great as fries or mashed like potatoes. Use within 5 days. 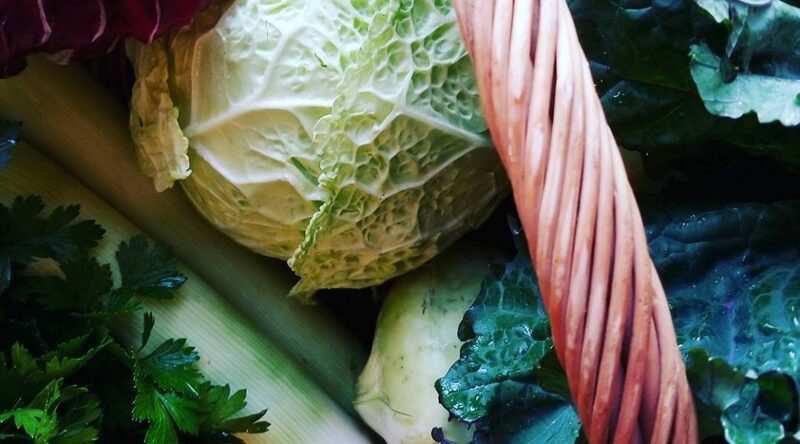 Cabbage – It’s a cabbage surprise this week–different varieties depending on pick-up location. Use within 5 days. Baby Red Kale – Some say take the stem off for salad, others say leave it be. Use within 3 days. Swiss Chard – Great in stews to keep you warm on chilly days. Use within 3 days. White Potatoes – Great in stews to keep you warm on chilly days. Store in a cold, dark and dry place. Use within 2 weeks. Winter sign-ups are open! Check out all the info, and a link to sign up online. Deadline for signing up is Nov 17. The 50/50 raffle is still going–buy tickets at pick-up. All proceeds benefit our Subsidized Share Program. Basically if you win you get half the raffle cash, and the subsidy gets the other half to help people in our neighborhood access food shares. The annual CSA Holiday Market will be Thursday, Dec 14th. Register online to reserve a table & join other local businesses (and meet all the CSA community!). We’re really excited about the vendors we have so far. Sugarloaf Chicory – Another one that looks like lettuce, but isn’t! This is closer to the radicchio family. Cut into thin ribbons and dress with olive oil, lemon, garlic, and parmesan to balance the bitterness. Store in the fridge. Use within 5 days. Scallions – Yep, there are still more for the eating. Store in the fridge. Use within 5 days. Collards – These are so healthy and similar to kale in versatility. Store the fridge. Use within 5 days. Sweet Potatoes – Get in your Vitamin A and beta-carotene for this week. Don’t wash until your ready to use–the dirt protects their fresh-picked skin! Store on your counter. Use within a week. Japanese Salad Turnips – They’re back for another round. Don’t forget to eat the tops. Store in the fridge. Use within a week. Baby Arugula – Wash gently and dress lightly. Store in the fridge. Use within 3 days. Cilantro or Parsley – Check your box, it’s a surprise which you’re getting this week. Store in the fridge. Use within 3 days. Here’s what’s in the box tomorrow—pickups are October 19th at Sunnyside Community Services from 5-8pm. **Don’t forget about the 50/50 raffle at pickup! All proceeds benefit our Subsidized Share Program. Basically if you win you get half the raffle cash, and the subsidy gets the other half to help people in our neighborhood access food shares. Carrots – Sweet and crunchy and ready for enjoying! Store in the fridge. Use within 5 days. Red Kale – Full of antioxidants and works in any of your favorite kale recipes. Store in the fridge. Use within 5 days. Yellow Potatoes – These are great for roasting. Store in a cool, dark place. Use within a week. Bok Choi – Enjoy another helping of these great veggies. Store in the fridge. Use within 5 days. Leeks – Great in soups or roasted alone. Store in the fridge. Use within a week. Parsley – Try adding it at the end of soup-cooking for a fresh color and flavor. Store in the fridge. Use within 3 days. Escarole – Do not confuse this with lettuce! The inner leaves are great raw, but the outer leaves are better cooked (they can be bitter raw). Store in the fridge. Use within 5 days.